This summer, I ventured on my first cruise in over 20 years. With ports like Jamaica, Grand Cayman and Cozumel on the Carnival Cruise agenda, to say I was excited is putting it mildly. You see, I LOVE the Caribbean…..the sandy beaches and warm waters. But this trip would be different. Very different. I was bringing my daughter. And ONLY my daughter. I’m sure many called me crazy at the time, but I have a well-behaved daughter who loves to travel as much as her mama, so off we went. After several days at sea, we began arriving in ports daily. But it’s the second port we stopped in where our adventure takes us in this blog post. Grand Cayman, the largest island in The Cayman Islands, a British Overseas Territory. Having a child who wasn’t yet an experienced swimmer in the ocean, and not having my husband with me to help, I had to choose not only a family-friendly excursion, but one which didn’t require ocean swimming. I didn’t need that added stress. Why not just explore on our own? Why an official Carnival Cruise excursion? I was traveling alone with my child and liked the added security of Carnival knowing where I was in a foreign country. I didn’t have to worry about transportation. All transportation would be provided as part of the excursion. I liked being surrounded by fellow cruise-mates, who could help out if a need arose. No need to worry about being late and missing the ship leaving port. With an official excursion, the ship waits for you. 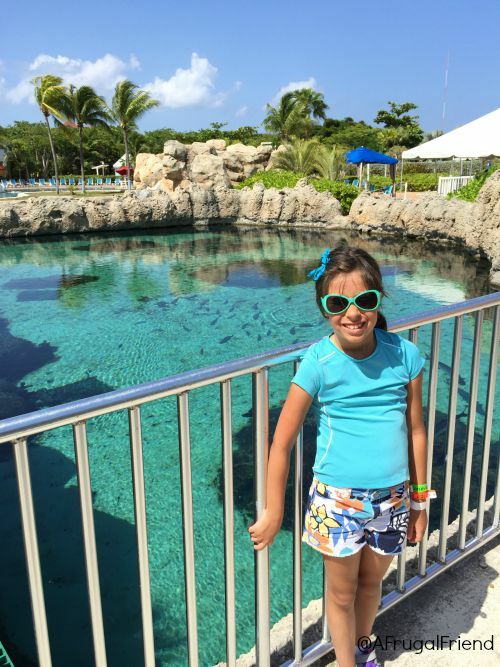 So with that said, we chose perhaps the most family friendly excursion there was (and there were so many to choose among)……a visit to the Cayman Turtle Farm. 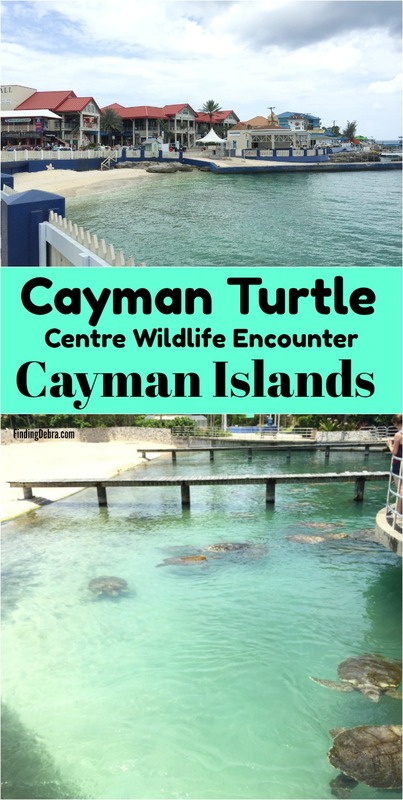 I was immediately impressed and so grateful we signed up for the Cayman Turtle Farm cruise excursion. The first thing you see when walking in is Green’s Breeding Pond. This is home to the Green Sea Turtles who have become mature enough to mate. The turtles here were quite large, some over 500 lbs., and you saw first hand the sandy white area where the females lay their eggs. It was here, at Green’s Breeding Pond, that we began our tour. Under a thatched roof (which was a nice reprieve from the blistering Caribbean sun), we learned all about the turtles and the farm from our tour guide. I’m sad to say that we needed a quick stop at the restroom and upon our return neither the guide nor our group was anywhere in sight. So from that point on we were on our own. 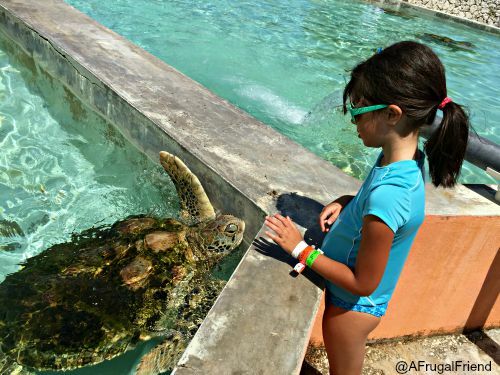 The Cayman Turtle Farm is the world’s only sea turtle farm……..but there is more to the attraction than just turtles. You’ll get to see more island wildlife than you’d expect – colorful tropical birds, sharks, iguanas and other local flora and fauna. 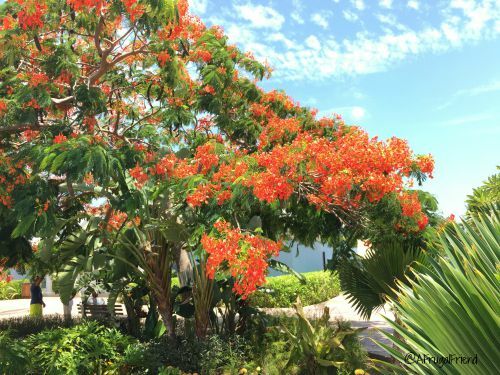 The flowering trees were just gorgeous……look at that brilliant orange. There are many activities that you can experience. 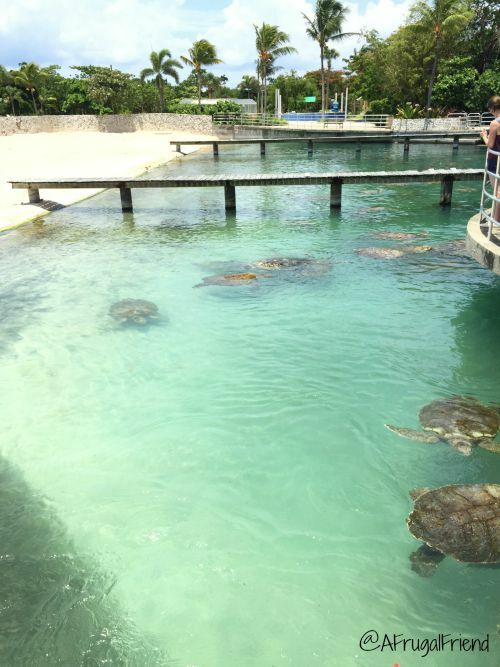 In fact, you can choose to swim and snorkel with marine life (yes, turtles) in a 1.3 million gallon saltwater lagoon. And while it looks like you would be in the same area as the sharks and barracuda……never fear, there is a separation. Snorkel gear was provided as part of the excursion, free of charge, but I do have a tip here. When we explored and made our way over to the lagoon area, we grabbed the snorkel gear, but soon had to abandon this activity. While there were changing rooms and lockers right near the lagoon, there were no locks on the lockers. With only myself and my child, I wasn’t going to leave a bag of valuables (camera, wallet) on a chair I couldn’t see as soon as I entered the lagoon. Sadly, I was told locks were available at the entrance of the park. The saltwater lagoon is far away from the entrance. So, we opted to skip swimming WITH the turtles, which in hindsight might have been less stressful for my daughter. TIP: If planning on snorkeling in the saltwater lagoon, grab a LOCK near the entrance BEFORE traveling all the way down to the lagoon. 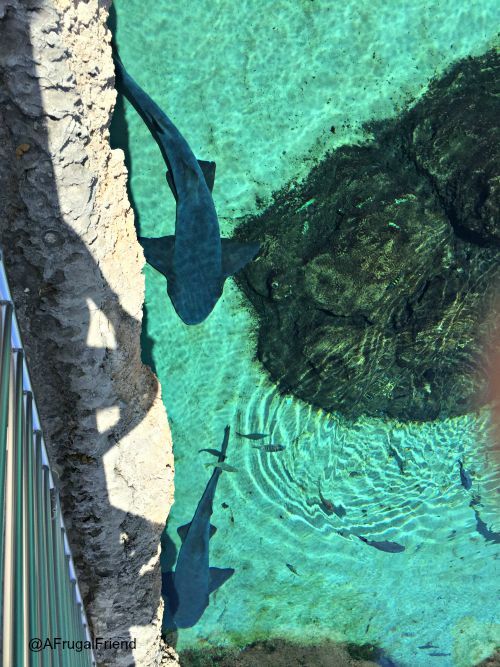 We enjoyed peering into the Predator Lagoon and spotted many sharks. We also spent a few minutes roaming through the free-flight walk-through Aviary. It’s very small but worth a stop. 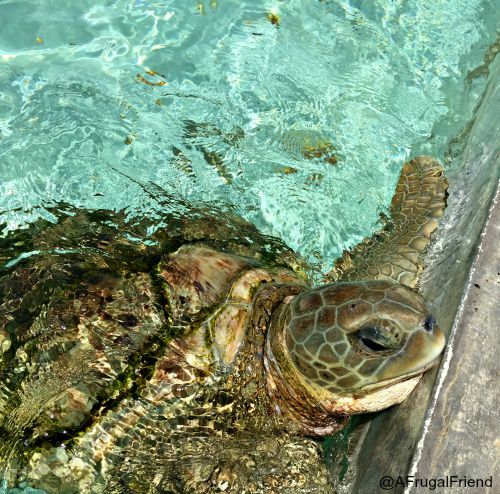 Next stop was Loggerhead’s Sea Loft…….where we found a few of these guys. Loggerheads are the second largest of the hard-shelled turtles, after the Green Sea Turtles. Apparently they have incredibly strong jaws, so no touching. She fell in love with this not-so-little guy. 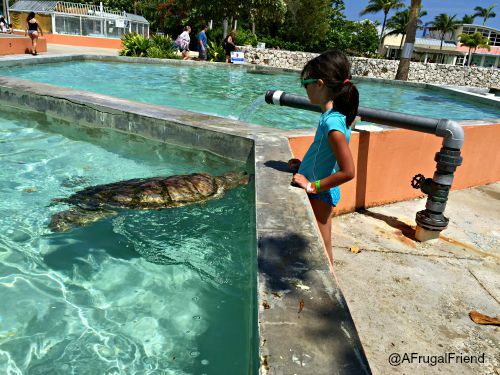 This turtle kept swimming right up to her……….she would have taken it home if she could have. And no worries……..she’s just waving hello to the turtle. I made sure her fingers didn’t get chomped. 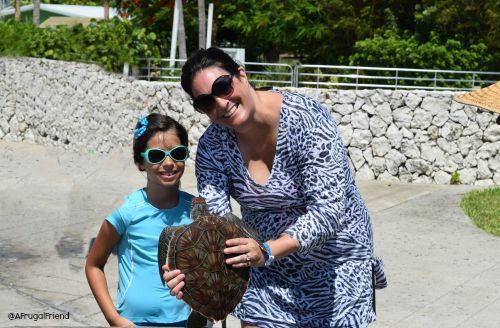 The highlight of any trip to the Cayman Turtle Farm – visiting the turtle tanks and holding a yearling turtle. It’s one of our favorite experiences from the cruise. DO NOT MISS. Anyone can step inside the water tanks and pick up a turtle, as the water line is fairly low. You are more than welcome to take pictures with your own camera. For those who want the entire family in the photo, you can spend $25 for a batch of photos they take of you. This will be sent to you via email after payment. Great for helping out young children with the turtle, yet still getting to capture the moment. And don’t forget to wash your hands after this at the cleaning stations. We wanted to make a quick stop at the Turtle Hatchery and the Education Center and ran into this guy sunning himself along the way. 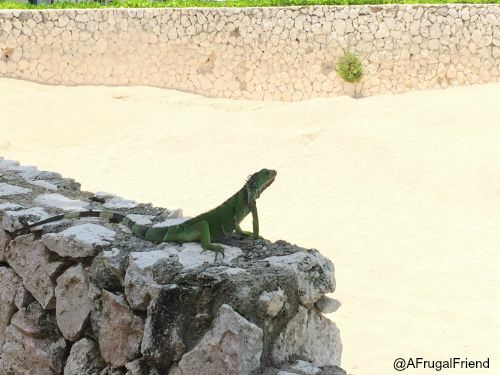 It’s a sight to see, almost startling for some, but in the Caribbean it’s completely normal for iguanas to just walk around. After taking this quick photo, we were able to view some recent turtle eggs in their indoor environment and learn a lot. In fact, we learned that some of the turtles are raised for consumption. Now this might sound strange, but it’s been a staple part of the local diet and traditional cuisine apparently for centuries. 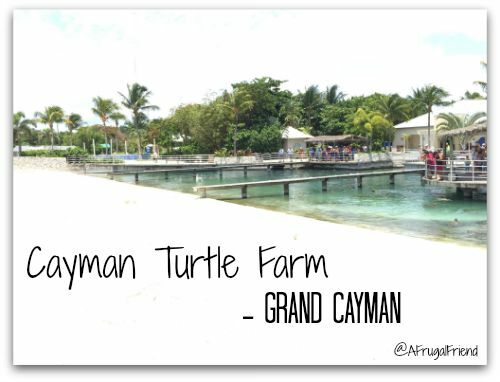 What is important to note is that the only legal source of turtle meat in the Cayman Islands is from this location. This has helped the conservation in that no eggs or turtles may be hunted in the wild. 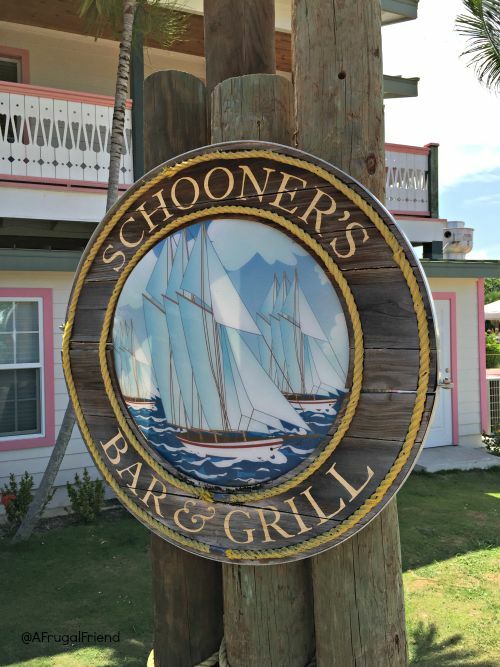 Schooner’s Bar & Grill is a nice on-site option for those wanting to grab a bite to eat or tropical drink. It’s not air conditioned, but is covered and shaded from the sun. And hey, there’s live music! With our excursion, there was an option to include lunch. We decided to go that route and a special buffet was set up for just us visitors from the cruise. It was Caribbean food, so if you have picky eaters, you may opt for bringing some snacks with you instead. When we decided not to swim in the saltwater lagoon, we opted instead to relax at Breaker’s Lagoon, the largest fresh-water swimming pool in the Cayman Islands. This lagoon is definitely more child-friendly, has lifeguards, and boasts an incredibly fun water-slide. This is where we hung out for the remainder of our visit. But alas, all good things must come to an end……but not before a quick walk through what perhaps was the best gift shop I’d seen the entire trip. We bought a beautiful ornament to remind us of our trip to Grand Cayman and a stuffed turtle to snuggle with. After all, this guy couldn’t come with us………. Have you ever been on a cruise? Did you take any excursions? this sounds so cool! If I ever visit the Cayman Islands (it’s on my bucketlist) I will def have to sign up to do this! 🙂 Thanks for sharing! Ok, that is wicked cool. My boys would flip their lids if they got to get up close and personal with turtles like that. I haven’t been on a cruise yet but I did take a trip to the Cayman Islands a few years ago. We visited the turtle farm too and had a great time watching and holding the turtles. That looks like so much fun! That turtle is really neat. The Cayman Islands is definitely on my list of places to go. Those photos are beautiful! What an amazing trip! I love that you felt so safe and still did so much- that is awesome! I’ve been on two cruises with my parents growing up…. my favorite excursion was a tubing trip down the White River in Jamaica. It was absolutely gorgeous. Tubing in Jamaica – so fun! This sounds like the perfect place for my family! Looks like y’all had a great time! We went on a Carribean cruise for our honeymoon and loved it! No worries about hotel, dinner reservations or car rentals. The cruise had it all. We went to Grand Cayman and experienced Stingray City. It was incredible! I would do it again in a heartbeat. I’s also love to visit the Turtle Farm. Oh how I love the Cayman Islands!! I’ve never done the turtle farm. If I ever get a chance to go back, it’s a must do on my list!! Wow I would love this! We have always loved sea turtles!